Wedding is not a one day event. Different kinds of rituals and occasions take place before and after the wedding. For instance, in majority of the cases, the engagement takes place few days before the wedding. An engagement ring is needed for the occasion and people usually wear the engagement ring for the rest of their lives. Along with the engagement rings, wedding bands are also adorned on the wedding day. Usually the band is worn on the same finger as the engagement ring. This creates a problem with many people as the engagement ring and the wedding band clash with one another. Either they do not match with one another at all or both are too heavy to be worn on the same finger. In such a situation, the two rings are worn on the ring fingers of each hand. People can see both the rings clearly and their beauty is noticed. As mentioned above, wedding bands and engagement rings are usually worn on the same finger and so it is important that they remain in sync with one another for that perfect look. Usually people tend to ignore this part and on the wedding day, there is great chaos as the rings do not match and refuse to set with one another. Wearing them together suppresses the beauty of both the rings. The best solution to this problem is to have the wedding band and the engagement ring customized. 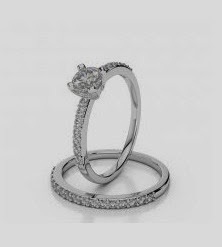 At A G & Sons, customized bridal ring sets are available. One ring is for the engagement and the other is for the wedding. They are designed in such a manner that they set perfectly with one another. The best pair of rings will have little gap between them so that individuality of both the rings can be noticed, yet they do not look out of place. While the wedding ring is little bold and bright, the engagement ring is simple yet elegant. The contrast between the rings makes the perfect combination. The best thing is that both the rings can be worn at the same time without any problem as they look like one piece with perfect setting. 1. You can choose from your favourite metal like yellow gold, white gold, red gold, silver, and platinum for the main base of the ring. 2. 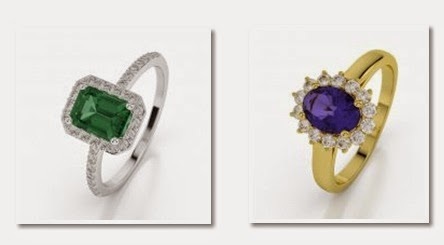 Precious and semi precious stones are also studded on these rings to make them look all the more beautiful. 3. Sometimes, just a single stone is used in the centre of the ring and sometimes, along with the centre stone, diamonds are studded all along the circumference of the ring. The color of the stone chosen can be matching with your wedding dress. Along with the wedding band, there are other wedding jewelries as well that are bought for the bride. It must be ensured that all of them are matching with one another. Otherwise things will look haphazard and the entire bridal look will be hampered. If precious stones are used in wedding jewellery, same coloured stones cut in a uniform pattern should be present in the wedding band, the bracelets, the earrings, the necklace and other pieces. In-fact the engagement ring should also be in sync with these jewelries. This is the reason it is recommended to purchase wedding jewelry from one place so that a perfect set can be obtained. Combining jewelries from various places can have differences in their cuts, patterns and designs.